2 friends, originally uploaded by Craftydiddl. Little Man’s dragon friends are all done. i like them. Yes, there is a but coming. i am not happy with the contruction of the mouth. 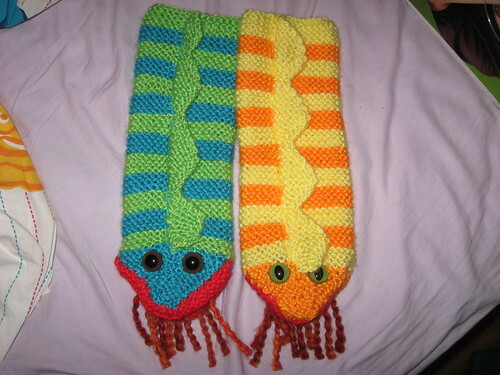 I have a picture on Ravelry or my Flickr if your interested in how they look on my hands. The blue ones mouth is worse than the yellow-i tried to make a fix but it didn’t help much. I really like how they feel-the garter stitch and the soft Caron yarn feel really nice. I think Little Man will like them! Yarn: Leftovers of Caron Simply Soft and a teeny bit of the yarn i got from Joanna for the flames called Wild Spice. It had the perfect red and orange mix for the flames. Needles: size 8 ,16 inch circs. Anyone going out for the crazy sales on Friday? Not me i avoid stores that day 🙂 i will be cuddling in bed. You got BOTH done!! They look great!! Happy Thanksgiving! And thank you for taking a look around for my calendar, yikes! The dragons are very cute. Little man will love them!